Here is a story in the Avadanasataka Sutra: At the Buddha’s time, in Sravasti, an elderly Brahman’s wife gave birth to a baby boy. Whenever the child was hungry for milk and as soon as the breast milk entered his mouth, the milk would turn bad. It was the same situation whenever he took in other food. Therefore, this had been how he grew up in a semi-starvation state. 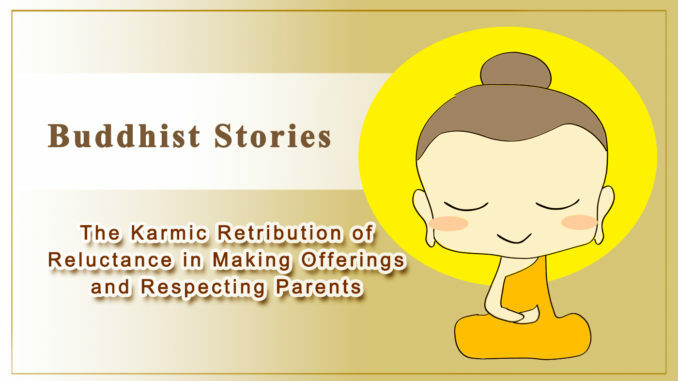 After he grew up, he beseeched the Buddha for renunciation from household life. Out of compassion, the Buddha approved it. After the renunciation, other Bhikkhus always returned with a bowl full of food after they went out to ask for offerings. Yet, he was the only one who returned with an empty bowl. One day, it occurred to him that he had to do something for the Three Jewels. Through the physical work, he wished to eradicate his negative karma. He resolved to clean up the monastery and miraculously, the next day, he returned with delicious food. Therefore, he became even more determined to serve the Three Jewels. This way, he got to have food every day. One day he slept in and missed the clean-up. Sariputra cleaned up the monastery as he passed by. He was very upset about this and told Sariputra, “I only get to eat after I clean up the place. Now, you have done it. I will definitely have nothing to eat today.” After Sariputra heard about that, he said, “It is no problem. I will go to the city and get food for you.” After he went to a layperson’s house, the couple happened to be in a quarrel. He returned with an empty bowl. The next day, Sariputra told him that an Elder had made a meal offer to the Buddha and the Sangha. The Buddha would take them along. After they arrived at the Elder’s home, everyone’s bowl was full of food, except his. They had missed filling up his bowl. He went to inform the owner about his empty bowl, yet no matter how he yelled out to the owner, somehow, he never could hear him. Sariputra could not bear to see this. He made up his mind to find food for him. The next day, he went out and got a bowl of food. When he got to the entrance, the door which used to be open suddenly shut closed with a bang. The bowl of food was hit by the door and spread all over the floor. Until the seventh day, the Bhikkhu had not taken a bit of food still. He cried out of sorrow and shame. He ended up eating the sand and died. Everyone was amazed by what had happened. They went to the Buddha and inquired about the karmic condition of the Bhikkhu. The Buddha told everyone, “At the time of Indradhvaja Buddha (Sovereign Sign Buddha), there was an Elder who loved to do good deeds and give donations. He often offered vegetarian meals to the Buddha and the sangha. He also had a son who followed after his conducts. The family property was managed by the father at that time; therefore, the son was not against the donations. After the Elder passed away, the son inherited the property. He became greedy and was unwilling to give. Other than being unwilling to give to the sangha, he also did not allow his mother to make offerings. However, his mother was frugal and tried to save to give to the sangha. One day, the mother told him, “I have nothing left to eat. Can you spare me any food?” He talked back at his mother, “I gave you food, but you gave it away to the sangha. Why don’t you just go and eat the sand?” Later, his mother died of starvation. Due to the negative karma of reluctance in making offerings and respecting parents, he degenerated into the hell realm after his death. After countless of eons he had finally made his way back to the human realm. In the same way, he still had to go through the negative karmic retribution of hunger and starvation. Because he did not oppose his father making offerings to the Buddha in the past, he then had the karmic condition to renounce in this life time. Nevertheless, because of the heavy negative karma of disrespect to his mother, in this life, he experienced extreme hunger and eventually died of eating sand. This is the karmic retribution of greed, disrespect to parents, and negative speech. In spite of the fact that he had renounced himself from the household life, he still could not escape from retribution. From this, we learn that negative karma can be very horrifying.